We service Aesculap, Oster, Wahl, Andis, Moser, Liveryman, Lister, Masterclip, Heineger, Hauptner & Wolseley clippers and stock a good range of the most common parts for them. 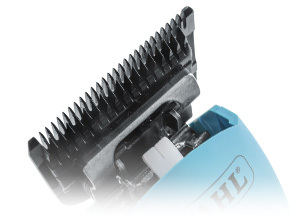 Our excellent, in depth service and repair of your clippers are usually carried out within a week unless we have to order extra parts or during peak season. Turnaround times can be checked here. 2. A cover note telling us whether you need a quote or a maximum repair cost to go ahead with. It should contain a description of the problem, what you require from us and you contact details including telephone number. PLEASE NOTE: You need to pay for clippers to be sent to us. Using our freepost address for clippers will incur an inward postage charge. We will then assess your clippers, provide a quote/service/repair them according to your instructions. You will then receive a phone call to discuss payment options. Small Clippers = £28.00 includes return postage assuming inward postage has been paid. Price is to service the clipper. Any parts needed will be at an additional cost. As standard, we use our discretion in deciding if a clipper is economical to repair and carry out work accordingly. Alternatively we will follow any instructions from you. We use new parts as standard but we can sometimes source good quality used parts if specifically requested. Quotes include a strip down, diagnosis and a technicians report. Should you not wish for us to carry out the work we can re-assemble them, provide a copy of the technician’s report and send them back to you for £15 or £25. Price assumes our freepost address was not used, if our freepost address was used an additional £5 or £10 will be charged. Alternatively clipper can be left with us and no charge will be made for the inspection. Large Clippers = £45.00 includes return postage assuming inward postage has been paid. Price is to service the clipper. Any parts needed will be at an additional cost. As standard, we use our discretion in deciding if a clipper is economical to repair and carry out work accordingly. Alternatively we will follow any instructions from you. We use new parts as standard but we can sometimes source good quality used parts if specifically requested. Quotes include a strip down, diagnosis and a technicians report. Should you not wish for us to carry out the work we can re-assemble them, provide a copy of the technician’s report and send them back to you for £25. Price assumes our freepost address was not used, if our freepost address was used an additional £10 will be charged. Alternatively clipper can be left with us and no charge will be made for the inspection.